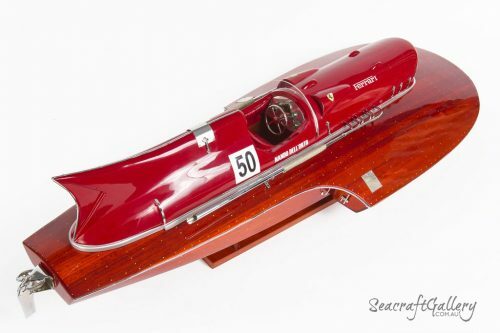 As one of the most famous speedboats of all-time, the Arno XI is a boat that broke records that were never surpassed. 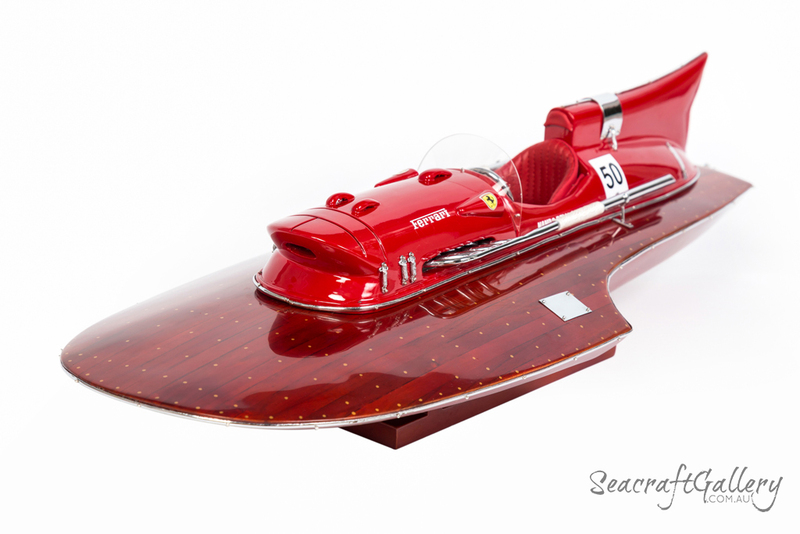 Capable of hitting a whopping 150.19mph on the Lake Iseo waters, it’s a record holder for an 800kg boat. 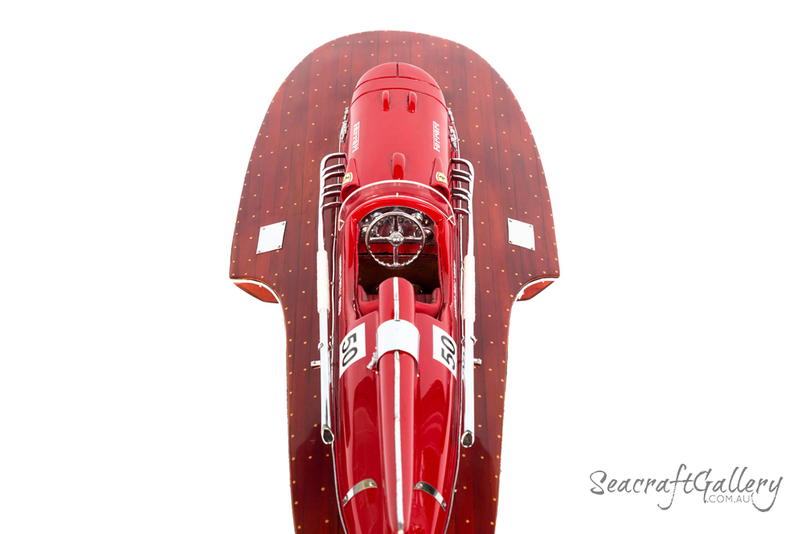 Having undergone numerous changes to create the mother of all hydroplanes, this was the brainchild of Achille Castoldi. After many changes and improvements, this set a still-unbeaten world record. For that reason, it’s a boat that holds incredible interest for boat fans and speed enthusiasts. 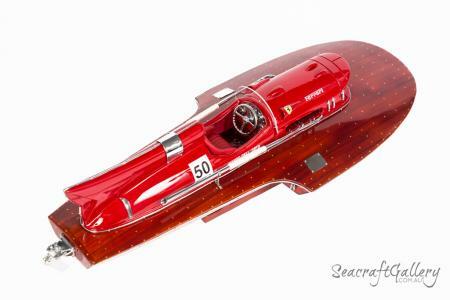 This 50cm speedboat model helps to complete any model boats collection. 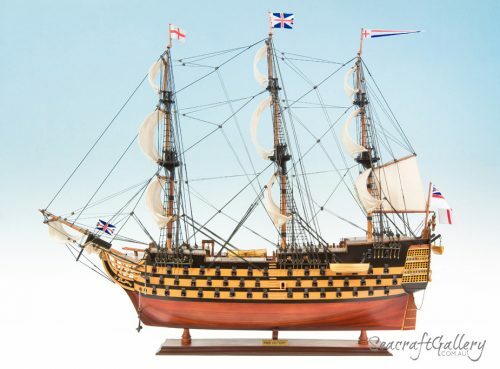 It’s an ideal wooden model boat, created with precision and attention to detail to everything. 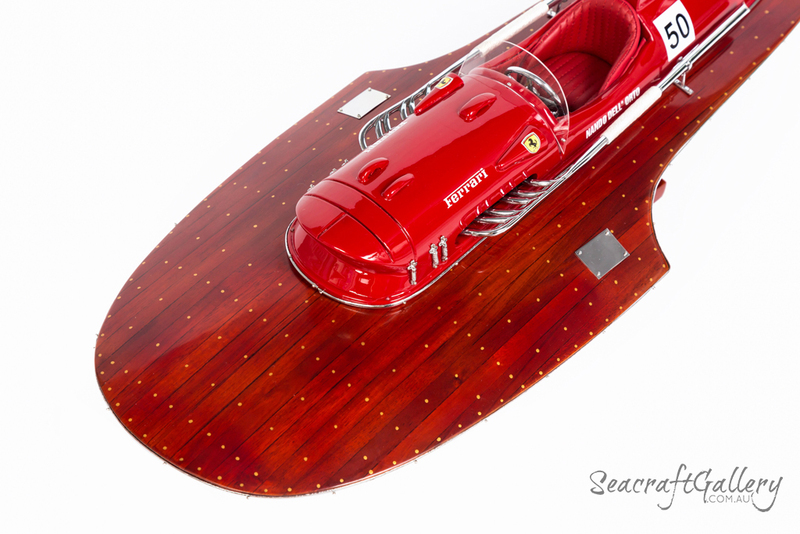 From the structure of the boat to the markings across the hull, this is a lovingly crafted speedboat model that lives up to the legend of the Arno XI itself. A perfect choice of boat for lovers of fast-paced, energetic boats that have made history both now and in the past. 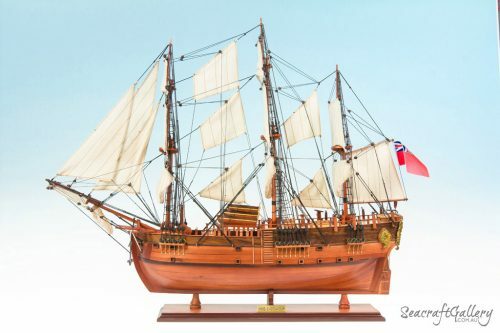 Handcrafted wooden model boats, following real-life plans and imagery of the Arno XI. Ready to display upon arrival. All parts of the boat are made with handcrafted precision, including the hull. Smoothed finish helps to catch every section of the boat, secured with varnish. 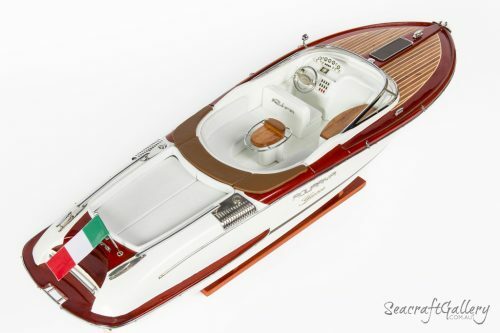 Micro-sanded finish also helps to ensure that the boat retains style for years to come. Brass and stainless steel fittings – not a single piece of plastic is included. Interior of the boat uses real leather for each of the seats. Extras like steering wheels and horns are all included with metal used. Gauges are included on the boat, too; these are not a sticker or a decal. Painted to match the famous design that the Arno XI broke world records in. Comes with a solid, secure wooden base to minimize movement or risk. Available for use and safe keeping within a display case: contact us for details. 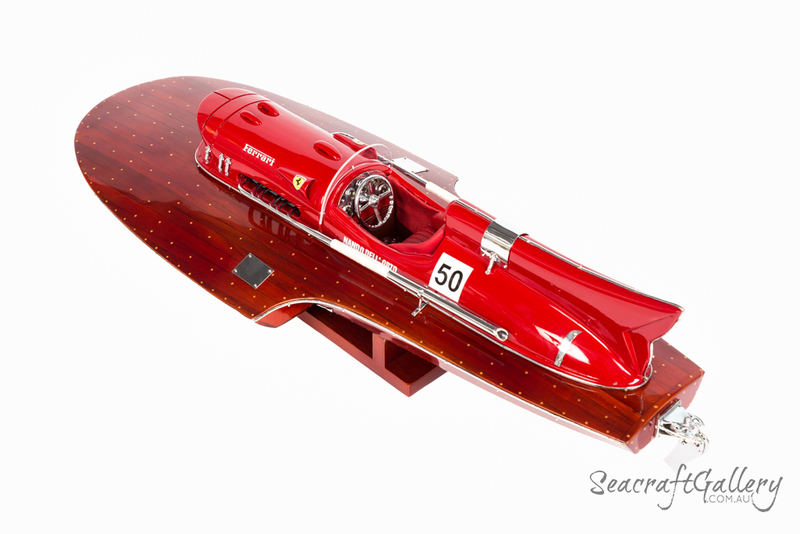 The perfect choice for speedboat enthusiasts, Ferrari fans or model boat collectors. The model is also available in bigger sizes: 70cm & 90cm. In 1953, there was a competitive edge about nautical travel. Many people wished to set new world records for the speed of travel on water. One man who was determined to do so was that of Achille Castoldi. 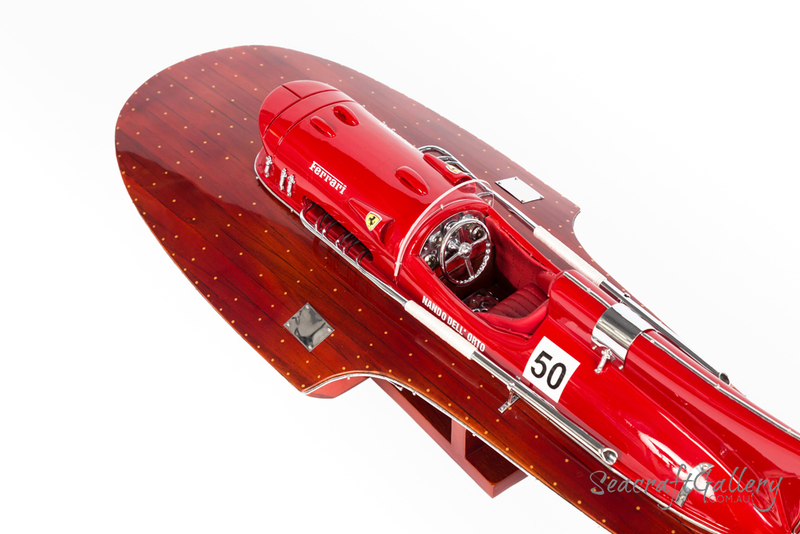 To do so, he set about commissioning the creation of what would become the Ferrari Hydroplan. He built an 800kg hydroplane hull for his dream boat but needed an engine of imperious power to make his dream possible. To do that, he turned to newcomers Scuderia Ferrari. He turned to boat building experts at the Cantiere Timossi boatyard, Azzano. It took some time to convince Enzo Ferrari to take part, though: at first, the legendary manufacturer was not convinced. Thanks to help from friends – including Luigi Villoresi – Castoldi got his wish. To do so, they created the 385HP, 4494cc 375 V-12 Grand Prix engine. This was their most powerful engine for a hydroplane, with 10,000RPM capable – unheard of at the time. He dubbed his new boat the Arno XI, and could not wait to try it out. 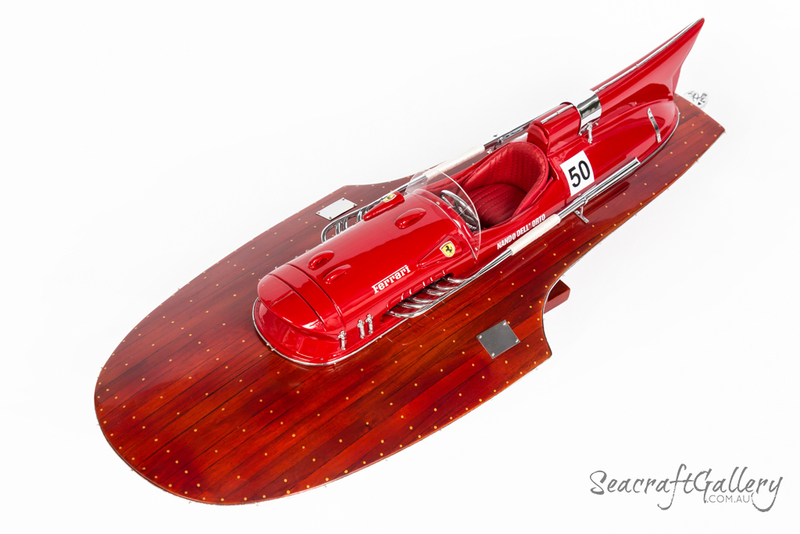 Come 1953’s Campione d’Italia races, then, Castoldi set foot in his new boat. Before the official two-way run, Castoldi impressed by hitting a whopping 124mph during shakedown testing. Long-term rival, Mario Verga, left him in his wake. He created a speed record of 125.68mph, followed by a 140.74mph speed record set two weeks later. Castoldi, then, needed even more! So, he turned to the Ferrari team once again – and this time had a 600HP 4.5L supercharged engine built instead. This methanol burning engine was a demon – even by todays standards, it would be impressive. Working alongside chief race engineer Stefano Meazza, and watched by Alberto Ascari, the then GP champion, success was found. On October 15th, 1953, the boat managed to achieve what he set out to do: it broke the 800kg class speed record with a 150.19mph speed record. The next day, the boat again set a record on the 24 nautical miles event – and this time, there was no comeback from his competition. Indeed, to this day, that record stands. Out on the Lake Iseo, a legend was born – all thanks to the work and craftmanship of some of the leading names of the era. 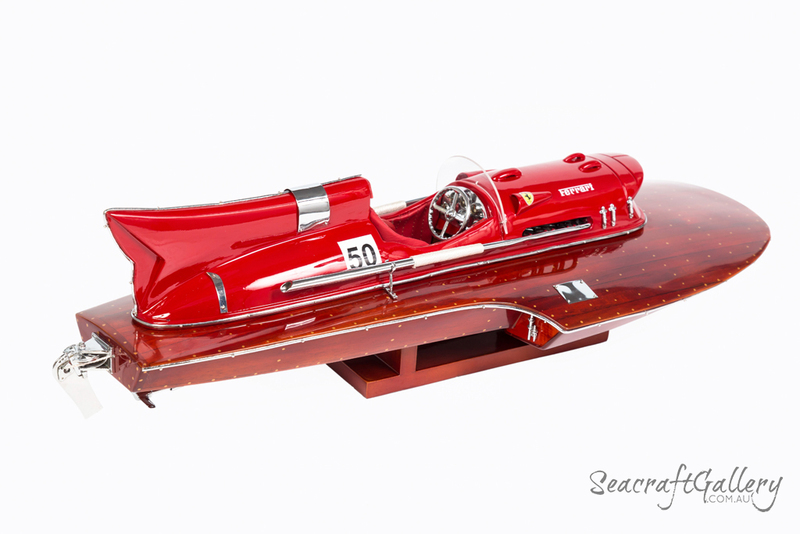 The boat was used in numerous racing competitions, before being retired in 1960. 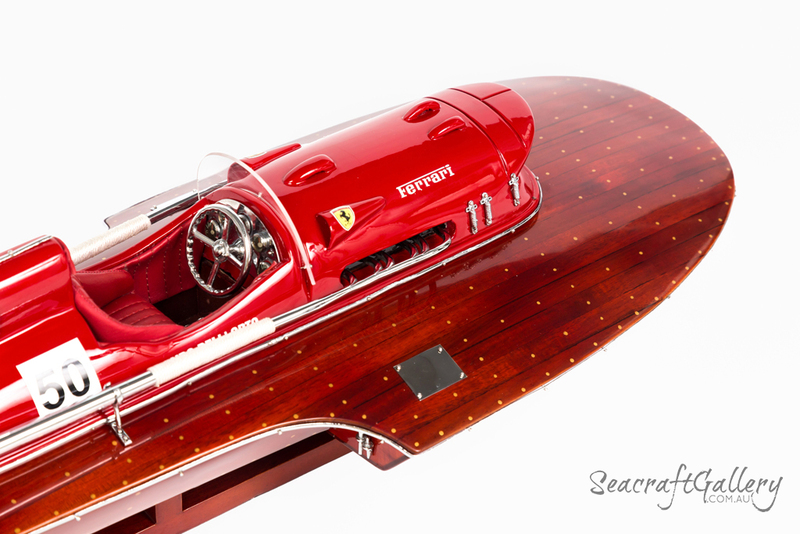 Since then, the boat has undergone many restorations and, today, could be auctioned for as much as €1.5m. She is a true legend of the seas, and it’s easy to see why: not many boats hold world records. It’s presently held at the Museo Ferrari, where it can be seen today.